Shirts With Random Triangles: Mississippi St. to wear pink football jerseys? So it's all come to this. 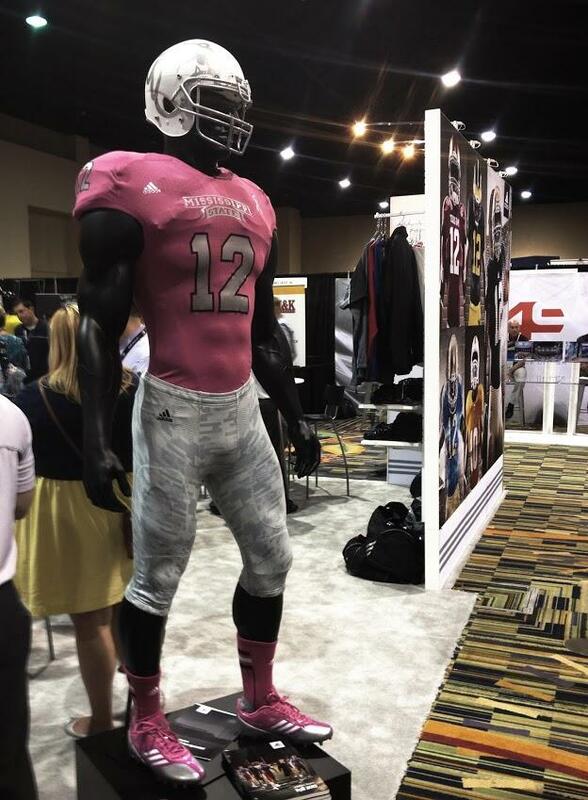 We all knew deep inside of us that one day, some college or pro football team of a least some kind or higher profile was going to bring out pink football jerseys. Apparently, thanks to Adidas, that day has come. Behold...the pink Mississippi State football jersey! Okay, even without any further info, I can make a good guess that this is somehow related with National Breast Cancer Awareness Month (or as I like to call it, October). Pro and college teams have broken out equipment like pink cleats and pink gloves and the like for years. But as far as I can recall, this it the first time a well-known FBS football program has gone with pink jerseys. I would have thought something like pink numbers or the like would have come first, but Miss. St. skipped ahead went Full Monty with the pink. Actually, the pink jerseys I could handle, as it's for a good cause. The white-and-grey camo pants? Not so much. Actually, it might be a little too much as a combo.